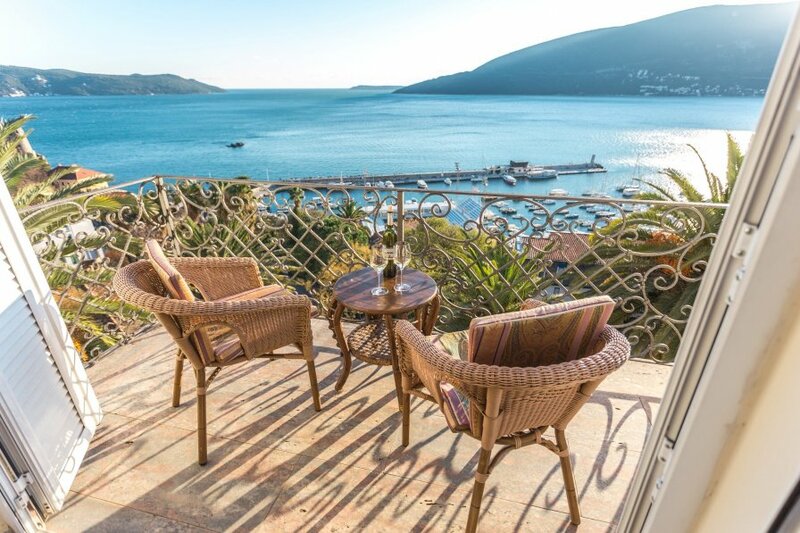 This apartment is situated in the very centre of Herceg Novi, in the vicinity of the Old Town, on a dominating site above the town harbour, with an exceptional terrace from which one gets unforgettable view of the entrance to the Bay in best location, just 100 m from the beach and in main center of town. It is on walking distance of 100-200 m from banks, post office, restaurants, grocery, bakery, market, souvenir shops, pharmacy, sightseeing, theatre...This apartment is in best location, just 100 m from the beach and in main center of town. It is on walking distance of 100-200 m from banks, post office, restaurants, grocery, bakery, market, souvenir shops, pharmacy, sightseeing, theatre...Extremely large and suitable for 6 peoples. Have 2 separated bathrooms for 2 bedrooms + one large bathroom with sauna and jacuzzi. It is indeed a unique example of Viennese Secession, in this region of the Mediterranean, furnished in luxurious style. Just below the apartment is the restaurant Di Palma, with large terrace enhanced by century-old palm trees and view of the sea, harbour and Forte Mare, a medieval fortress on the shore. There one can taste dishes from Montenegrin, Mediterranean and Italian cuisine and local wines as well.